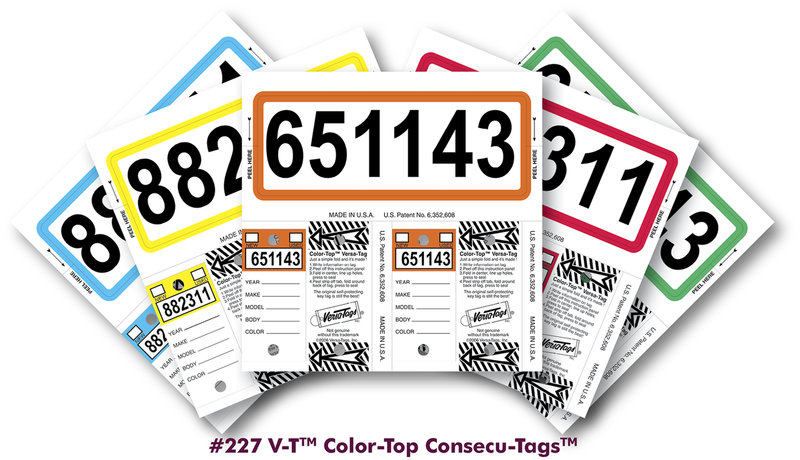 Color Top, Versa Tags Consecu-Tags by Versa Tags Inc. Same great self laminating key tags/stock tags with color only on the top of the key tags and a matching border on the stock tags. Remainder of tags are white. Feature: NOTE: All additional boxes orders will be in consecutive numbers from the first box ordered. Feature: If a different series of numbers or colors are required enter first series to the cart and start again. "NEW" Now available with BLACK and RED imprint color. (see pics.). no additional cost. Color Top Consecu-Tags Key Tags. Same great self laminating key tags/stock tags with color only on the top of the key tags and a matching border on the stock tags. Remainder of tags are white. 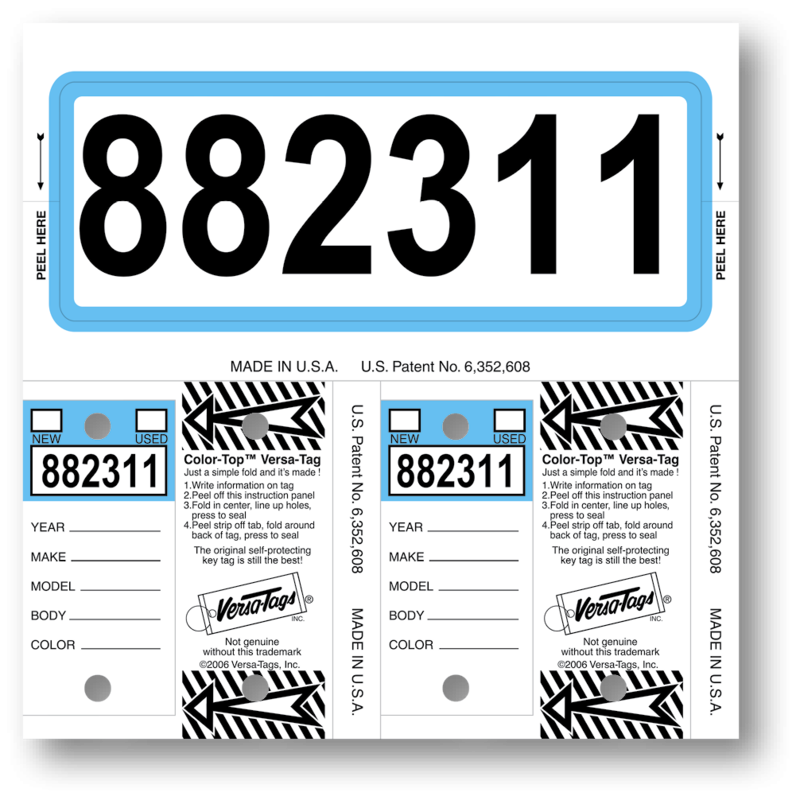 Keep track of your vehicle inventory with these Consecu-Tags numbered Key Tags and Stock Tags all in one. 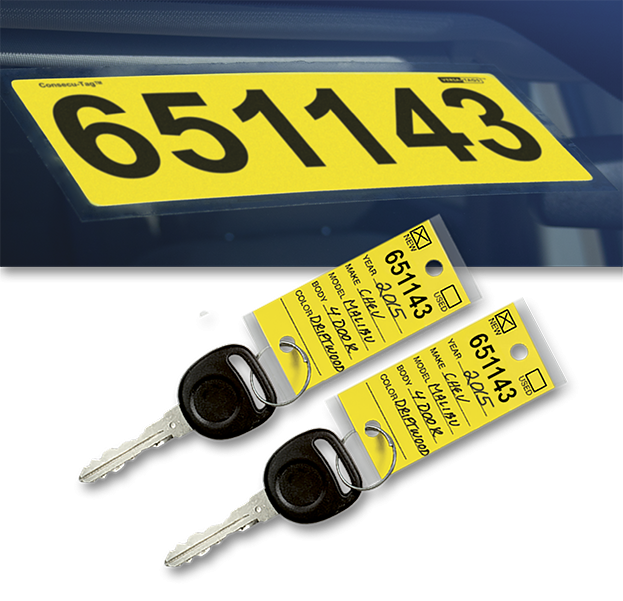 Each Consecu-Tag makes two self laminating genuine original Versa tag key tags and one matching plastic back windshield stock tag that seals on all four sides to the inside of the vehicle windshield. Available in your own custom stock numbers. Any combination of up to 7 numbers and letters of your choice. (Popular stock number combinations are the model year first followed by a stock number of your choice). Example: for a 2018 model year vehicle, (1801234). 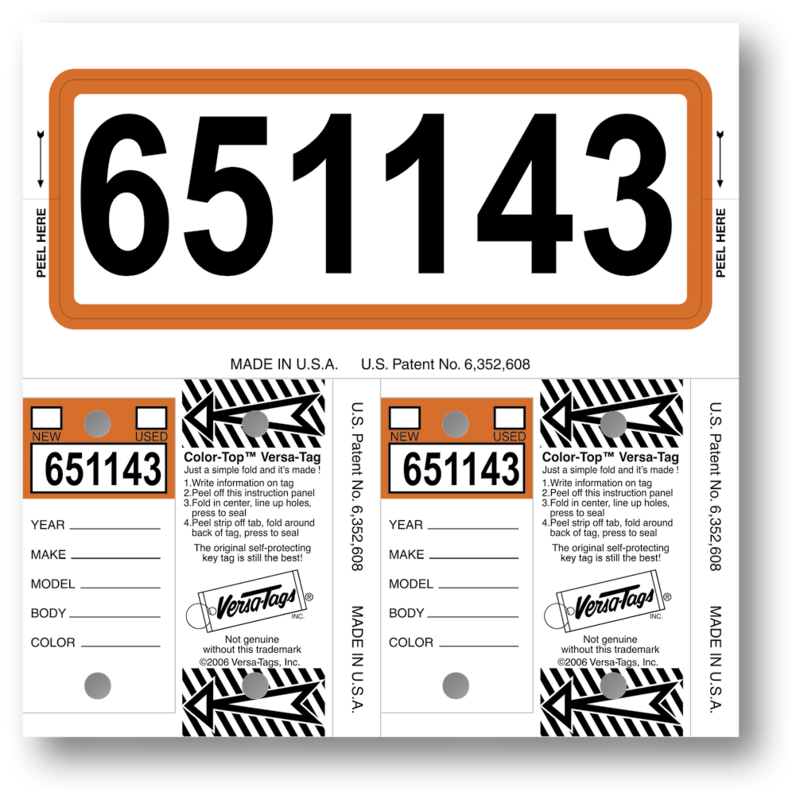 Great way to keep track of the model years of the vehicles on your lot. A letter can also be used with numbers. Example for a 2018 Ford vehicle: (F180123). Bright colors and large numbers to be seen from a long distance. Available in 5 colors, Yellow, Blue, Red, Green and Orange available with Black or Red stock numbers. 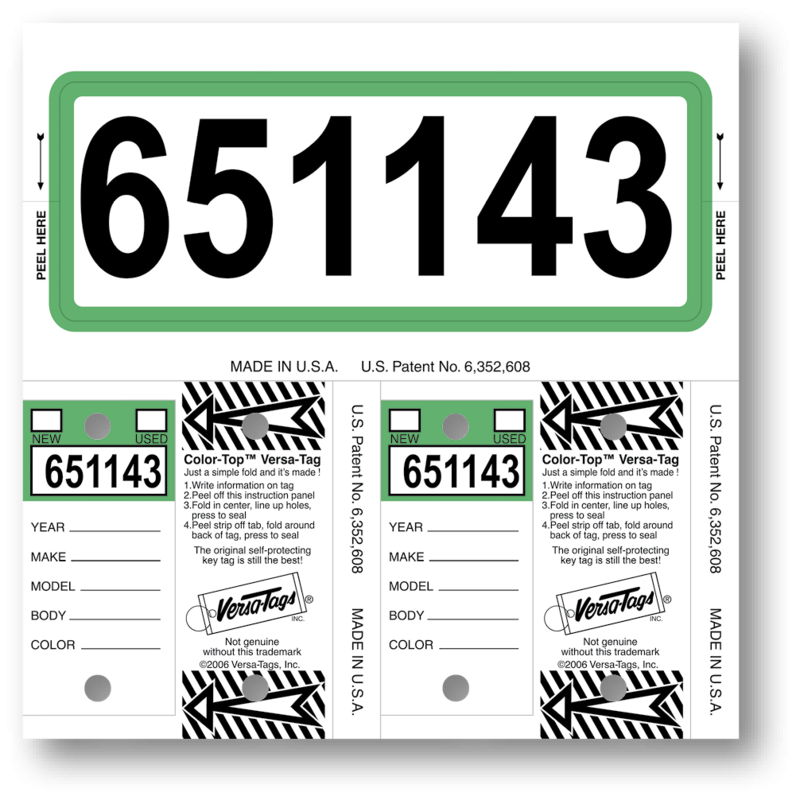 Blank key tags and stock tags also available for you to write your own stock numbers. Enter BLANK in the starting numbers box. 125 key tags and stock tags per box. Key tag rings also included. Size: Key tags are 3" x 3" and fold to 1 1/4" x 3". 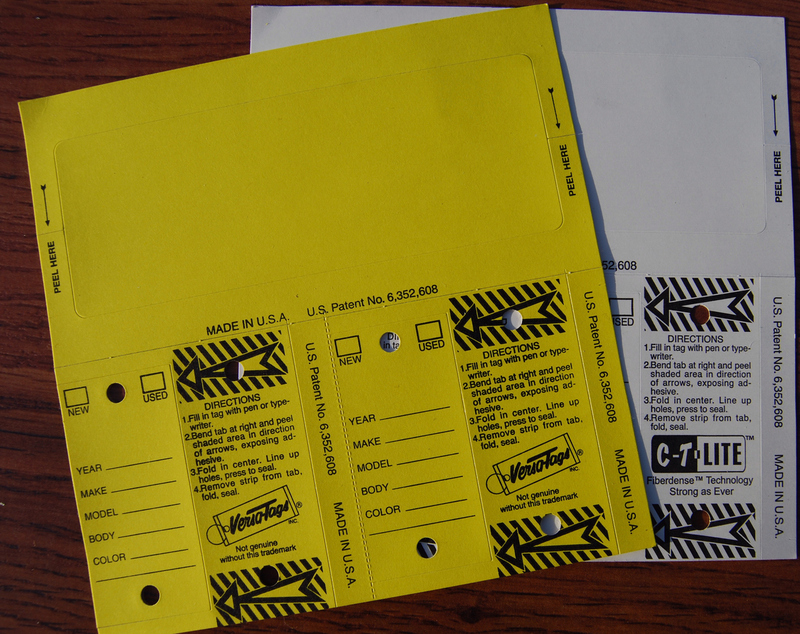 Stock Tags are 3" x 6" and have clear back with adhesive strips on all four sides. Please enter your custom stock number combination in the starting numbers box. All numbers will be consecutive. Example: 1100000 - 1100124 if you want 7 digits. If more then one box is ordered all other boxes will be consecutive to the first box. If you would like BLANK tags, please enter BLANK in the starting numers box above. 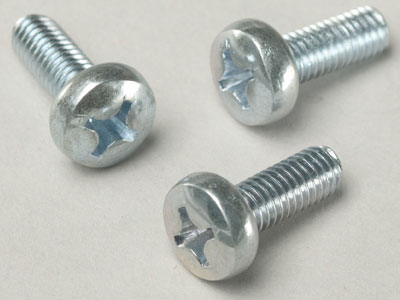 Please allow 2 to 3 days of production time to ship.